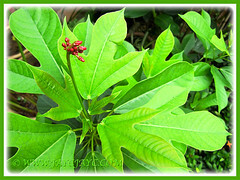 Plant Jatropha integerrima to spice up your garden! An irresistible and spectacular shrub, Spicy Jatropha makes an excellent ornamental plant or accent in any garden or landscape. 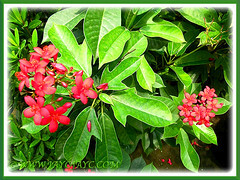 It is free-flowering nearly year round in the tropics and sub-tropics. 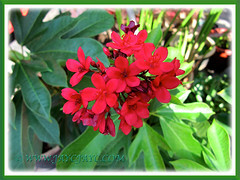 Truly a showy shrub that displays beautiful clusters of brilliant scarlet red flowers held upright above the handsome dark glossy green foliage that forms the perfect backdrop in wonderful contrast! We did enjoy their lovely presence in our garden when we brought home a young flowering plant with 4 stems last September. Unfortunately, our delight lasted only for a short span of six months before seeing it succumbed to attack by the soft scale insects. It was growing so luxuriantly and suddenly without warning, the leaves just went completely limp, and the next day turned yellow, wrinkled, dried and dead. So sad to see our gorgeous plant helplessly snuffed out by these garden pests! We parted ways too fast and so unexpectedly. Hmm… now, we have to find a replacement shrub to fill the gap… wonder what plant we’ll welcome home next! Any suggestion? 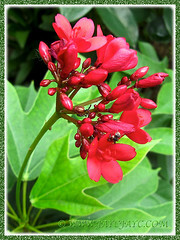 Common Name: Spicy Jatropha, Peregrina, Chaya, Firecracker, Firecracker Jatroph, Star of Bethlehem. Etymology: The genus name, Jatropha is derived from the Greek words for physician and nutrition, in reference to the use of various species in this genus for medicinal purposes. The species epithet comes from the Latin words integer meaning entire, unbroken, or untoothed, and rimus meaning mostly so or to the greatest degree, referring to this species having few lobed or toothed leaves. Origin: Native to Cuba, Dominican Republic and Haiti in the Caribbean. Plant type: An ornamental perennial shrub or tree. Features: Jatropha integerrima is an attractive species of the genus, Jatropha that consists of approximately 170 species of succulent plants, shrubs and trees. 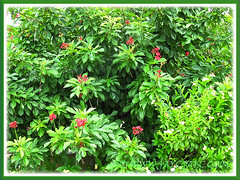 A tropical and evergreen shrub that grows moderately between 3.05 – 4.57 m tall and spread as wide in the wild but generally much smaller in cultivation, about half the stated size. 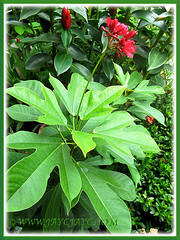 Probably, the popular cultivar sold to home gardeners is Jatropha integerrima ‘Compacta’. It is typically multi-trunked with slender stems that originate somewhat close to the ground and are covered with dark glossy green foliage. The leaves are arranged alternately, simple, 10.16 – 17.78 cm long, oblong or fiddle-shaped, as well as come in various lobed patterns, sometimes with small lobes and pointed on the leaf margins. Almost all year round, it will send out many rounded clusters of brilliant rose-red or scarlet-red flowers on upright flowering stalks, held above the dark green foliage in full view. Absolutely showy and attracting much attention! The 2.54-cm-wide flowers are star-shaped with five-petals and filled centrally with yellow stamens. It has an unusual floral characteristic where the male and female flowers grow in separate bloom clusters, either at different times or on different parts of the same plant. There is another variety that produces pink-coloured blooms instead. Flowers will then set seed capsules containing several smooth and speckled seeds which can be used for propagation. Beware that all parts of the Spicy Jatropha are poisonous, including these seeds. 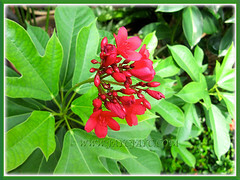 Culture (Care): Jatropha integerrima (Spicy Jatropha) is undemanding and grows easily with minimum maintenance. Light: Full sun to partial shade for best growth and flowering. It does tolerate full shade but seldom will it flower. Moisture: Low to moderate water requirements. It is drought tolerant once established, but not salt tolerant. Soil: Tolerates most kind of soils as long as well-draining. Can be clayey, sandy, loamy, acidic or alkaline. Others: Needs pruning occasionally to get a strong structure and kept bush-like. Also, occasional tip pruning is recommended to shape and encourage more branching, resulting in more blooms that appear on new growth. It can take hard pruning too. Staking may be necessary for a matured multi-stemmed bush to prevent branches from flopping and maintain a pleasing appearance. Feed once monthly with a balanced fertilizer. It is resistant to most pests and diseases. Occasionally though, it can be infested by mites, scales, and superficial leaf miners. Look out for signs of early infestation and treat it accordingly before it gets to destroy the whole plant. 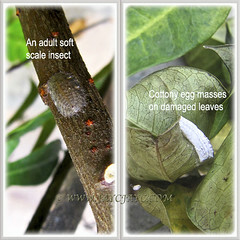 We were not vigilant and caused our Spicy Jatropha to be killed by soft scale insects recently. For subtropical and temperate regions: Hardiness: USDA Zone 10b-11. It can be damaged by frost in zones 9b and 10a. Even if frozen to the ground, it’ll recover quickly if provided winter protection. For non-hardy regions, best to grow it in container, to overwinter easily inside the house or garage. Water sparingly during winter and more often during hot weather. Flowers from late spring to early fall. Take stem cuttings in spring to propagate new plants. 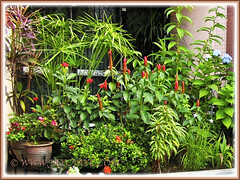 Excellent shrub to add a tropical touch to one’s garden and to attract hummingbirds and butterflies (especially monarchs and swallowtails). Propagation: By seed germination or stem cuttings, the latter preferred as easily available and easily rooted. 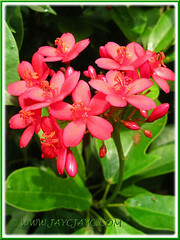 Usage: An attention-grabber, Jatropha integerrima makes a great container plant on the deck, patio or at poolside. A reliable flowering shrub that blooms almost year round, it’ll be excellent as an accent or specimen in any garden. This attractive ornamental shrub will be a lovely addition for the back of a sunny border. Planted en masse, the Spicy Jatropha bushes can be used to create an informal hedge or screen for privacy and even suitable for landscaping along highway median. It is an attractive magnet to invite butterflies and birds to your yard.